A new government report ranks the most depressing jobs and career fields, based on survey results. The most depressing job field? Personal Care Workers, which includes child care, elderly care and disabled care workers, reporting that almost 11 percent had battled depression in the last year. This category was followed by Bartenders/Waiter/Waitresses and general Health Care/Social Workers. Overall, 7 percent of full-time workers reported battles with depression over the last year. But the bright side to this finding shows that simply being employed full-time can be a bulwark against depression. 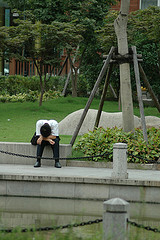 Consider that the same study reports almost 13 percent of unemployed people suffered bouts of depression. The full study can be read here in PDF format, with the nifty chart ranking career fields by levels of depression found on page 2.